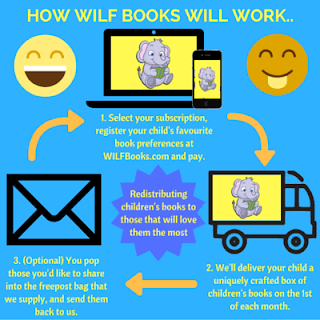 Recently I came across WILF books and got a chance to try out their subscription service. Blake really loves us reading to him as well as looking through books on his own and babbling away to himself. The 3 books that we were sent are great for his age and interests. We had a book based on sharing, Peppa Pig fun at the fair and Elmer's weather. When you first sign up you will be asked to fill in a survey so that they know more about your child such as their age, interests and what type of books they love to read.Your books will than be delivered to your door on the 1st of each month. When it comes to signing up for a subscription you opt for a monthly, 3 month or 6 month subscription. When Blake's subscription arrived I loved that it was addressed to him with a little note inside for him on a postcard. This is a great little book about sharing. Blake is at an age where I am trying to get him used to sharing toys etc when we are out and about with friends or at places where he needs to interact with other children. A book about going to the fair - Blake seemed to love the story although I was a bit put off with one of the sentences in the book which I personally thought was a bit sexist. Blake has an Elmer book already but not this one. I love that it tells you about all different types of weather to help kids with learning and with such a lovable character. Overall I feel the subscription is a fab idea as children love books and the service provides you with books suitable for your child's age and interests. It's great that your child gets it sent in their name and they get a personal note for them in the box. I think this is such a fab idea - double thumbs up from me! Love this idea! My son is a complete bookworm (has been since he was tiny) and he would love this! WILF books sounds like a great subscription service and I like the sound of Elmers weather. I used to love Elmer as a kid! I'll recommend that to my friends with kids. It's so important to make children familiar with books at the early age. It makes learning easier in the future. This sounds like a fantastic subscription. Reading is such an important activity for children and having books delivered for their age and interests is wonderful and it is so fantastic that they are addressed to the child and include a little note. I love subscription packages like this - always so interesting to see what you're going to get. And probably things that you wouldn't have found yourself. Great to discover new products! What a great concept for children! I need to do this for my nephew. Oh, nice decision to subscribe. This will help kids learn more and enhance their reading skills. Love the idea of this subscription and only wish this was around when my son was a baby, Elmer is one of my favourite characters in a book! What a great subscription package, books are a big hit with my toddler and we can never have enough! This is a great idea. Darcey loves books so I will be looking into this. The Elmer books were some of my boys favourites when they were little. I used to love book sales at school when I was a child and this looks like a great, modern take on that idea. My kids love reading new books. This would be great for them. This sounds like a lovely idea for encouraging little ones to enjoy books. This looks fab, we love books in our house, and this is such a great idea. I am surely signing up for this! It is such a great idea for kids to get into the habit of reading! We love books and my boys love reading. I will have to look into this subscription service! Anything that encourages a love of books and reading has to be a good thing.